"The thought underlying the Report is that the railways should be used to meet that part of the total transport requirement of the country for which they offer the best available means, and that they should cease to do things for which they are ill suited. ..... Coal traffic as a whole just about pays its way, but, in spite of its suitability for through train movement, about two thirds of the coal handled on rail still moves by the wagon load. This is very largely due to the absence of facilities for train loading at the pits, and to the multiplicity of small receiving terminals to which coal is consigned." - The Reshaping of British Railways, 1963. 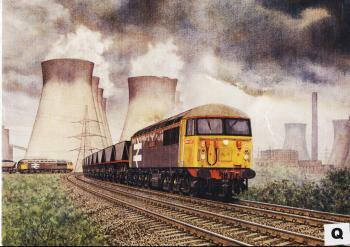 Here two Class 56 diesel-electrics demonstrate the foresight of Dr. Beeching's words as they exert 3250hp apiece to haul Merry Go Round trains in and out of Ferrybridge Power Station, near Doncaster. Merry Go Round is the jewel in the crown of today's highly efficient bulkload Railfreight business. A mobile conveyor belt bringing coal direct from pit to power station in a smooth, continuous operation at speeds of up to 60mph. Each train carries around 1,000 tonnes of coal, which is loaded and unloaded while still on the move, in a single movement representing the equivalent of a convoy of road crunching lorries. As Britain's roads continue to choke on their own ever increasing traffic, rail is still patently the best way of transporting large quantities of goods over long distances; and do it quickly, cleanly and with minimal damage to the environment. Department of Energy studies show that rail is three times as energy efficient as road in moving bulk supplies, although sometimes the message has trouble getting, through the vociferous and powerful road lobby. Faith in Railfreight to deliver the goods is shown by its many customers who take advantage of government grants to install private sidings that enable trains to run straight onto their premises. These major customers usually own or lease their own company branded vehicles, and in 1986 the Somerset-based quarrying firm of Foster Yeoman took the unprecedented step of purchasing four superdiesels from General Motors in America to haul its trains. A truly remarkable display of its confidence in the long term future of Railfreight. It's all a far cry from the inefficient wayside pick-up freights, clanking lines of unbraked mineral wagons and time-consuming marshalling yards of little more than 25 years ago. Which is exactly what Beeching envisaged, of course. The 135 Class 56s, introduced in 1976, were designed exclusively for Railfreight work and are fitted with a special control system to allow them to move MGR trains at a constant speed of 1/2 mph during loading and unloading. Both the 56s in the picture are in the Railfreight Sector's grey livery, which is currently being modified, and bear rather prosaic names - Blyth Power and Port of Tyne Authority - which typify BR's new commercial policy toward locomotive naming. Names are now chosen for their publicity potential or in the interest of fostering good relations with key customers. It's easy to scoff at names like Top of the Pops or British Steel Teesside but to do so is to ignore the massive TV coverage among an audience InterCity was anxious to reach achieved by the former, and the financial worth to Railfreight of the latter. Steam locomotive names, of course, were always glamorous, appropriate, free from the taint of nepotism and nothing to do with vulgar mass entertainment. Pretty Polly, Spearmint, E. Tootal Broadhurst and Doncaster Rovers excepted!